I commend you: you know your ball striking ability is below average. You accept that. You know that your equipment plays a large part in how well you can score. 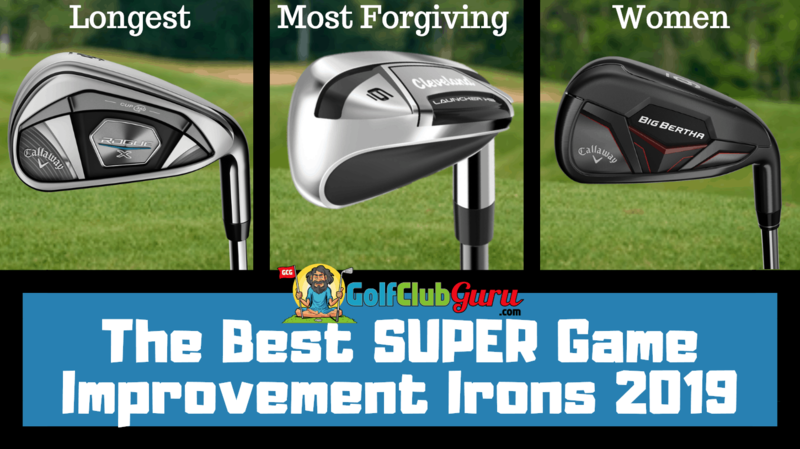 You probably know that super game improvement irons get a bad rap. But you don’t care, you just want to shoot better scores. Good for you! Alright, I’m done commending you. You need to go work on your ballstriking, my friend! SUPER forgiving: that’s the main benefit of this type of iron. They’ve got large toplines and large soles. The sweet spots are much larger than other irons, and the results across the face are pretty similar. Whether you hit it dead center on the face or 1 inch left/right, the result won’t be that different. That’s a good thing, assuming you miss the center of the face pretty often. Decently long: Distance is not the main benefit for super game improvement irons, but companies know that you like to hit the ball further. You’d much rather have a 8 iron into a green than a 6 iron, so companies adjust and make lofts relatively “stronger” to make the ball go further. Easy to get the ball in the air: super game improvement irons are designed with the perimeter weighting low on the irons. This results in high launch angles, perfect for those that struggle with getting enough height on their iron shots. Now that we know the benefits of this type of iron, let’s talk about the best sets that you can buy for 2019. Note: I’ll make some money if you click on any links/pictures (which will send you to eBay) and make any purchases. Thanks! If you are looking for the longest irons that you can get your hands on, these are it! The Callaway Rogue X irons are BY FAR the best combination of distance and forgiveness. And that’s exactly what most of you are probably looking for! To be clear: these irons have very strong lofts. They are very long for their respective lofts, but I just wanted to throw this out there. That means they basically took what used to be a 7 iron and are now calling it an 8 iron, to make you feel better about how far you hit the ball. I’m not saying it’s misleading, but I just wanted to let you know. Either way, there is no denying how forgiving these clubs are. No matter how badly you miss the center of the clubface, you’re sure to end up with a halfway decent result. These sweets spots are massive, and the weight is distributed in a way to increase ball speeds across the entire face. 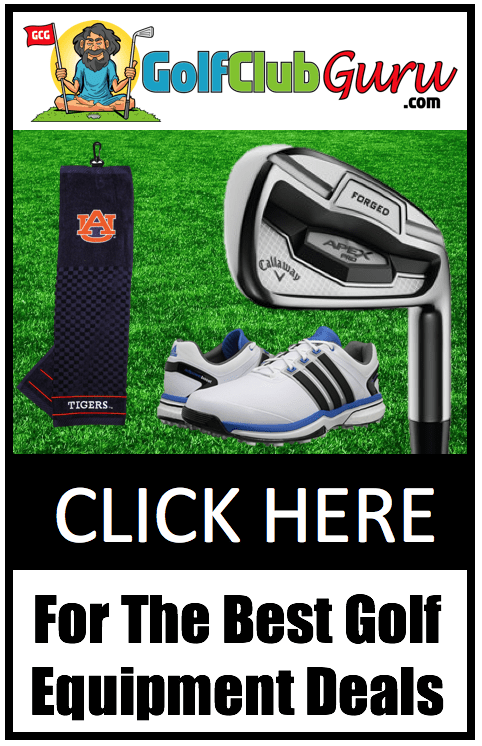 If I were a high handicap golfer, I would be very interested in these clubs for good reason. Distance and forgiveness can go a long way towards reducing your score, that’s for sure! If you are specifically looking for the most forgiving clubs that you can get your hands on, check out the Cleveland Launcher HB irons. They are practically hybrids considering how oversized the club heads are. The more weight behind the club face, the more likely you are to end up with a good result even on a mishit shot. These clubs are perfect for those that struggle with getting the ball high enough in the air. Supported by the name, these irons really do launch the ball to incredible heights very easily. If you already hit the ball too high for your liking, I would suggest a different set for you. These irons are by no means as long as the Rogue X irons, but they are for sure a bit more forgiving. If you’d rather improve your consistency rather that add 10 yards to your shots, this is the set that I would recommend to you. The two iron sets that I mentioned before this one can be expensive, no question about it. If you are like me and like bring frugal with your golf club purchases, check out the TaylorMade AeroBurner HL irons. The AeroBurner golf clubs were a lower budget release back a few years ago, and they have consistently fallen even more in price each year. They are one of the most sold and best reviewed super game improvement iron sets on Amazon, if that tells you anything. I have not hit them myself, as I couldn’t find them in any stores or at any demo days. The reviews can give you a good picture though. These clubs are pretty chunky, meaning they have a lot of weight behind the club face, like the Launcher HB irons. They get the ball up in the air pretty easily, but they lack in distance and feel, which is to be expected. For the price, though (less than half of the other prices), they are a good investment. You can take the money that you saved and instead invest in a couple of lessons. 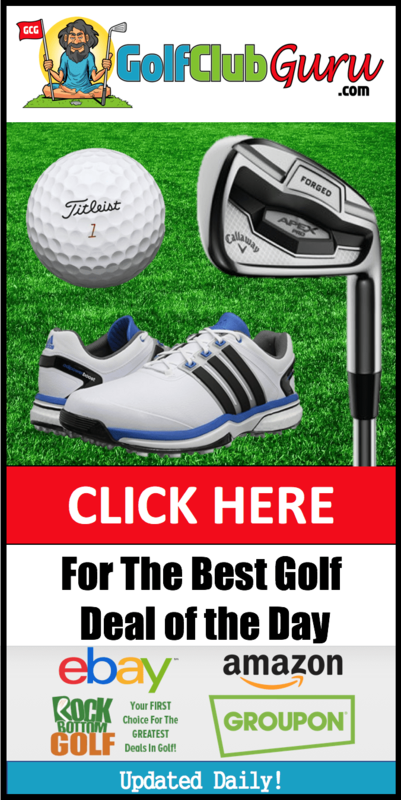 Improving your golf swing is likely to have a more beneficial effect on your golf scores than those brand new, freshly released 2019 irons. Womens irons are slightly different than irons for men, but not by much. The club heads and the club shafts are simply a tad bit lighter, allowing women to create more club head speed and hit the ball longer. It appears as though Callaway has just released their new model for the year, the Callaway Big Bertha 2019 womens irons. They are revamping the Big Bertha clubs, which has been done a couple of time in the past. This iron set is very attractive in my opinion, as I’ve always been a fan of all black club heads. These super game improvement irons are perfect for women. They will allow you to hit the ball as far as possible while maintaining great forgiveness for your off center strikes. Their technology, which they call “Suspended Energy Core”, is just a fancy way to get the ball to fly high off of the clubface very quickly. Many women have a difficult time getting enough height on their shots, so this club is specifically designed to be launched way up in the air with ease. This article will be updated throughout the year as new clubs are released. Let me know if you have any questions below. I would love to hear from you! Hi there! This post could not be written much better! Reading through this article reminds me of my previous roommate! He continually kept preaching about this. I will send this article to him. Fairly certain he’s going to have a very good read. Thank you for sharing!